This secluded country retreat offers stylish accommodation designed especially (not exclusively) for the romantic couple. 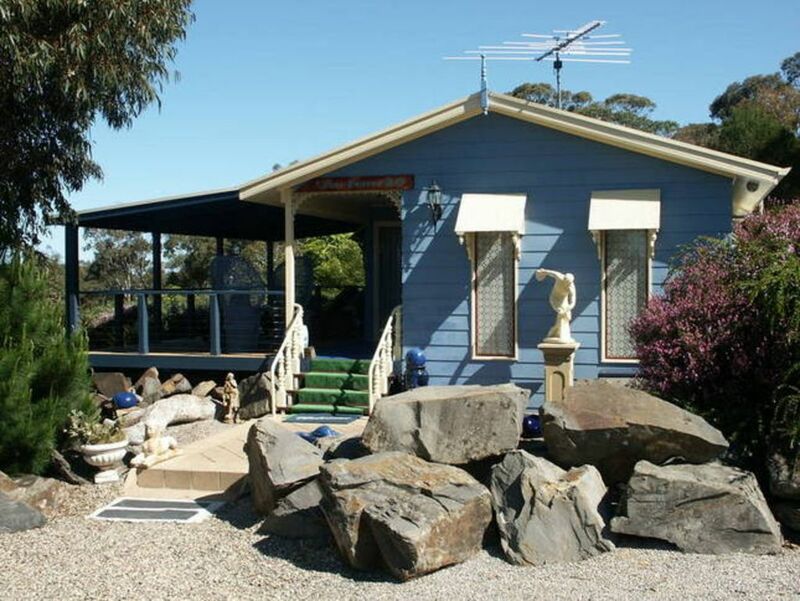 Whilst you have the feeling of being miles away from anywhere, you are surprisingly close to wineries, award winning restaurants, spectacular surf beaches at Middleton, the stunning Horseshoe Bay at Port Elliot, the beautiful Victor Harbor and a short 9-minute drive to the historic river port of Goolwa. Imagine a romantic stay in a quaint cottage with far reaching views of the southern coastline of Goolwa and the world heritage Coorong. Escape to a hillside hideaway and experience being at one with nature. You will find "Cupid" has left his magic touch here. From the moment you arrive, you are immediately put under "Blue Heaven's Cottage" magical spell. "Blue Heaven Cottages" are fully air-conditioned. Quality furnishings, spa, en-suite and four poster bed, TV, video selection, DVD and CD player are provided and on your arrival there will be red,white wine and a gourmet welcome platter awaiting you. A country breakfast of bacon, eggs, mushrooms, tomatoes, cereals, fruits, jams and fruit-juice will be left in a fully equipped kitchen to be cooked at your leisure. Enjoy "Al-Fresco" dining on the large under-cover outdoor deck. This charming cottage offers the very best in secluded comforts. Advance bookings are essential. Payment by cheque or cash only in advance. All of cottage one, but with rural views, kitchenette only, 2 seperate bathrooms (one is en-suite) and laid out on different levels. A beautiful little cottage set in an amazing surroundings, a beautifully kept property with amazing views. Simply Superb,amazing cottage in beautiful quiet surrounds.Extremely clean & amentities and provisions provided were beyond expectations. Thank you Geoff for your visit and for the great review. It was a joy to have you here as guests. Thank you for leaving everything clean and tidy, much appreciated. We wish you both a "Happy New Year" and we hope to meet again at some future time. Awesome location, good for a romantic getaway. My partner and i had an awesome time for our anniversary, would highly recommended to other couples. Jayden and Bianca were a pleasure to have as guests. They are quality, happy people and could be recommended to anyone. Thank you Jayden and Bianca for your visit and for celebrating your anniversary at "Blue Heaven". Also for leaving everything neat and tidy. We hope to see you again at some future time, that would be great. A absolutely beautiful romantic cottage!! We both thoroughly enjoyed our stay in this beautiful cottage in fantastic surrounds! Our hosts gave us a very warm and friendly welcome which was really appreciated! With a lovely platter of nibbles and wines to have, also plenty for a hearty breakfast in the morning just made our stay at this place perfect! A 10/10 for our hosts and this gorgeous property!! Well worth it for that romantic getaway!! We will definitely be visiting again! !